In more ways than one, this posting is about splitting rock—1) the literal task of splitting rock for a miniature chimney, and 2) the more cerebral task of bashing my mid-20th Century brain against the rock of Millennial technology to get it to spit out the photos I want to write about. I hope you will laugh with me when I tell you the solution was as simple as, yes, tripping over a rock—look at the screen long enough and you’ll see the button you’re looking for. It’s a good thing it wasn’t a rattlesnake. Which leads me to one more aside—our recent vacation in the Arizona sunshine (with no snake sightings, but lots of spiny flora)), which included an afternoon talk at the wonderful Mini Time Machine Museum of Miniatures in Tucson. It was a thrill to see the museum, and to re-visit the Greene & Greene House–probably our most accomplished piece—as well as our funky Airplane Café, giving you a hint as to the eclectic nature of this very personal and wide-ranging collection. The museum is beautifully and imaginatively conceived, and well worth the trip to Tucson. As with every project, Noel made a watercolor sketch before construction, as much for the client to see what they were getting as for us to see what we were aiming for. Often the hows were not articulated or even thought about—we just knew we’d figure out something. In this instance the “how” of how we would make a stone chimney was the problem, and a sizable one, as the stone façade was a massive feature on the project—a major architectural element we needed to execute well. 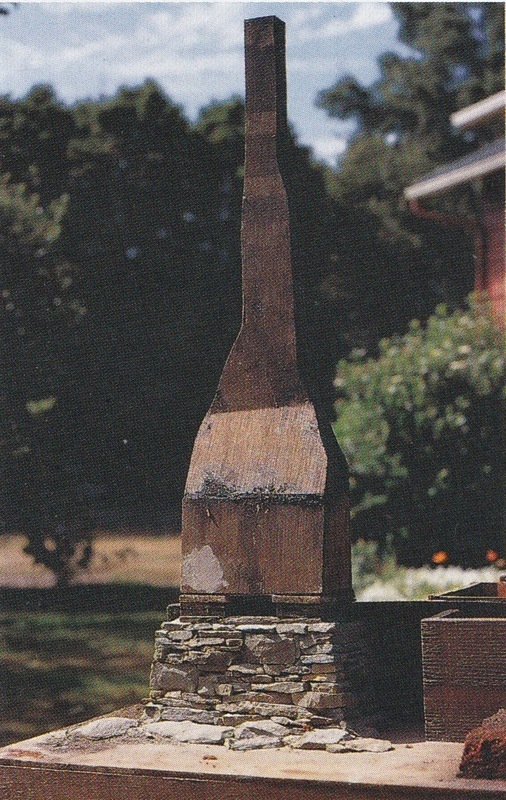 First Noel made a hollow plywood chimney following the design he had put down in the original sketch. Then came the stones. Originally we wanted a buff-colored stone, such as that found around Carmel, CA, but without reasonable justification for the long trip to Carmel, we explored other options. One morning, Noel headed out to the nearby Columbia River, and brought home a carload of hunky rocks in a warm gray color—probably basalt, given the location, though it’s usually a darker color (Karin Corbin says it’s probably limestone). 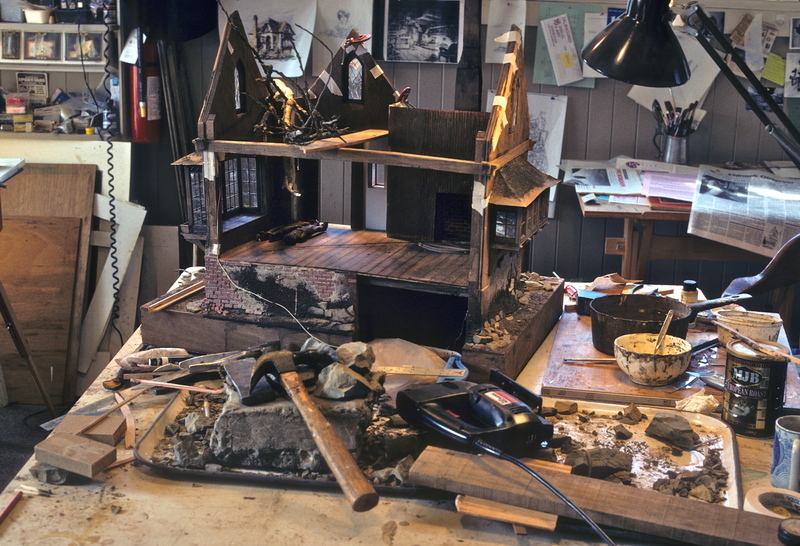 He spent an afternoon splitting, shaping, and gluing some of them to the chimney base with Elmer’s white glue. Satisfied with the results, he went back to the walls, and the stained glass windows framed in windfall holly twigs from the yard, and I took over the rock pile. My tools at hand were an old metal butcher tray (supposedly to contain the mess), a concrete paving stone, an iron firewood-splitting wedge, chisel, and a large hammer. Eventually I found that reducing rock to stone with a wedge or chisel (with the paving stone underneath so as not to go through the table) requires more timing and position than hard-hitting. I started splitting the rock by giving the end of the chisel a solid whack with the hammer. The trouble was, the whack attack caused the stone to shatter horizontally, sending pieces flying everywhere. Not only were they hard to find in our messy studio, but flying stone shards are dangerous to the occupants. Step 2 was to set up plywood baffles around one part of the room, so the pieces would mostly bounce back into my work area. I can only hope I was wearing goggles. After randomly chipping for a while, I discovered what stone masons have known for centuries–rock has a language. I could “talk” (or maybe it was listen) to it. I began to get a feel for the material, the individual rocks, and where to locate the best splitting spot. After more trial and error, I learned to better anticipate where and how to find the smaller stone forms within the larger ones. When I hit that spot just right, it was a medium tap, et voila!, a handful of usable sizes lay on the table. The shapes of cut stones could further be adjusted on the sanding wheel of our scroll saw–this is hard on the motor, but the remaining life of that saw was limited anyway. Once I split a rock close to the sizes needed, I sanded off points, and flattened edges, sides, tops and bottoms on the sander, as needed. Back on the worktable I could also make finer adjustments with pliers, and a sanding block with 100 grit paper. The rest of it was just getting into the Zen of the stone shape and sizes, the puzzle pieces, and how they fit on the plywood chimney form. For extra adhesion, and to fill the gaps between the rough-edged stones, I made a “putty” mix of sifted sawdust mixed with Elmer’s, a little water, and Bug Juice to gray it. I then stuffed the mix behind and around the stones, forming a contoured bed. Eventually these spaces, along with the stones, would be dirty water washed, colored and mossed to bring it all together. As I worked my way up the front of the chimney, a narrow slot more or less formed itself in the stonework. Rather than fill it in, we hollowed out the wood behind it. I decided it could make an entrance, a link to where Noel’s mind was taking the interior—the suggestion of another mini-mini civilization inhabiting the project. 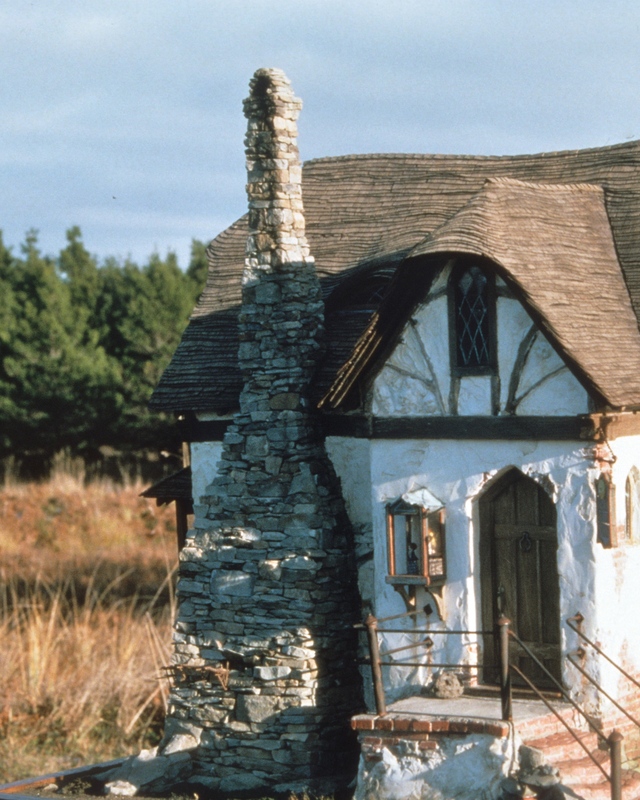 After all, it was a fantasy building–home to Gepetto. 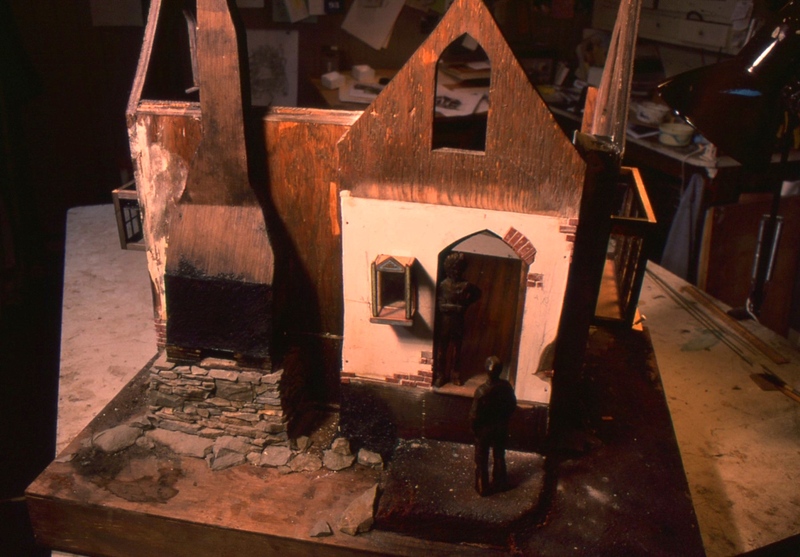 Inside the slot, I made a smaller-scale, rudimentary staircase–going down into the dark interior—carved from plaster of Paris mini bricks in a color barely distinguishable from the stone. It’s subtle, as I didn’t want to draw attention to the stairs, but to allow a viewer to discover them. Anyone probing beyond the staircase might find an opening in the ground, where another staircase presumably goes down. To what and by whom, was the mystery. 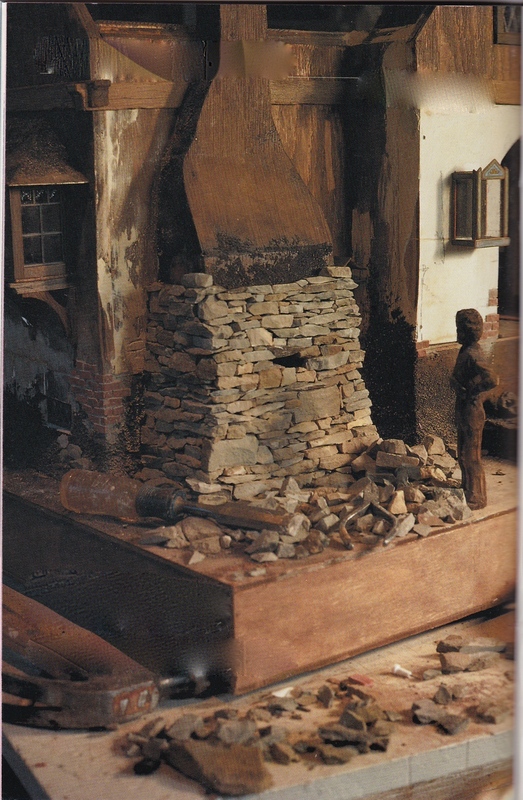 The project was finished in this photo, but it gives you an idea of how the chimney and entrance looked together. Once the monumental rock job was finished, we realized something was missing in the overall design. The front of the building had two major architectural elements—the chimney and the entrance–with a narrow stretch of wall between. Rather than join the two, the wall just became a blank white space. Something else was needed to unify those two major features. If we stared at it long enough, and/or dreamt about it, the answer would come. 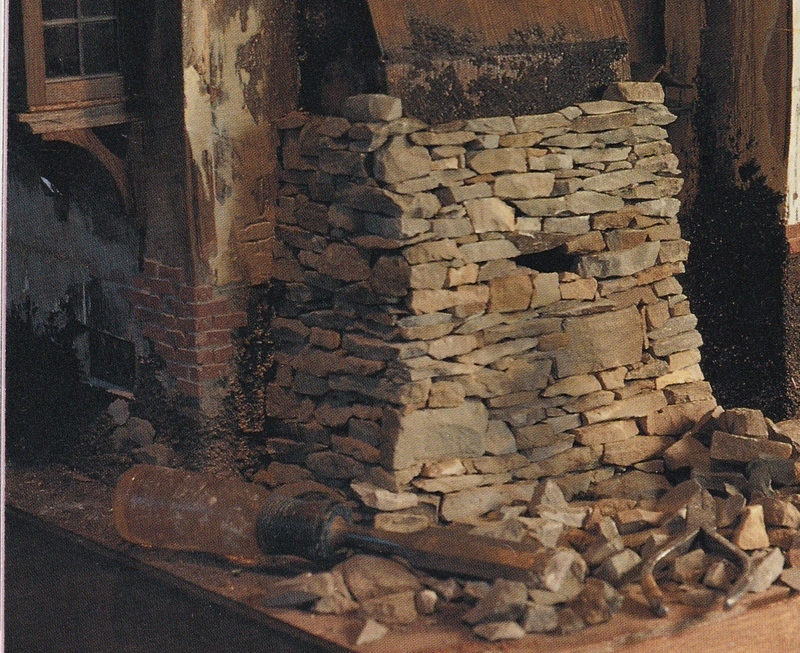 This entry was posted in Houses, Miniatures and tagged dollhouse miniatures, mini rock chimney, toymaker's house. Bookmark the permalink. Thanks, Sue. I’m pretty happy to have it done, too. It is not basalt, its limestone. There is a geological streak of it in the area where you harvested the stone. Some old quarries are around there. The fact that you could spit it the way you did and the color of it both indicate it is indeed limestone.I have some of a similar color I got from the old quarry by Lime Kiln Lighthouse in the San Juan Islands. Thanks, Karin, I had no idea there was limestone in the area. Your stories are such enjoyment. Thanks for sharing! And thanks for the great feedback! what a lovely Easter gift-another blog from you- thank you so much- I look forward to your exploring your past work! Thanks Barbara, stay tuned for more! This has been sitting in my inbox until I could take the time to enjoy it. And I did. 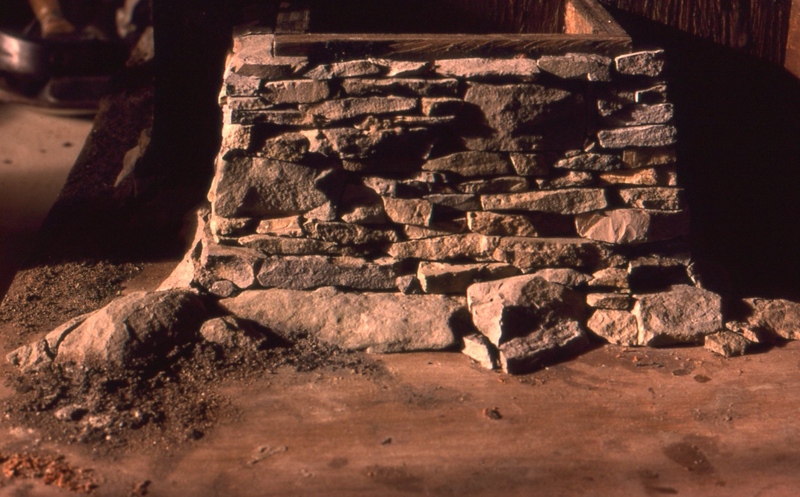 I am reminded of our trips to New England and learning about stone walls – because there is nothing quite so beautiful, especially after years and years and years. Thanks, Pat! Thanks, Christi. Your ducks were pretty cool, too! I feel the echoes of your rock work travail. Some years ago I took a mosaic class in Ravenna, Italy, where we learned to use a hammer and hardie to cut marble and Venetian glass slabs into tesserae. Our teacher did tap tap tap and there was a bowl full of perfectly cut pieces, seemingly effortlessly. Of course our student experience was far more varied, and humbling. But by the end of the course I had begun to have an inkling of mastery, or at least intention. Nothing else compares to individually hand-cut stones. I salute your achievement (as always). Hi Nancy, Wow! chipping glass and marble in Ravenna sounds like a lot more fun than rock in WA, but thank you for comparing my work to your teacher’s. Rock or marble, it would be no less daunting, or humbling. I agree, it is getting the inkling that’s exciting.